Standard - $7.99 Only 7 left! To children, candy is equivalent to gold. So with Halloween right around the corner, your kiddo will basically be taking part in a gold rush. He'll want his treasures to be held in the safest way possible. Well whenever Gotham needs protecting, Commissioner Gordan can always count on Batman! Take a page from the commissioner's book and have the Dark Knight keep your little one's treats secure. 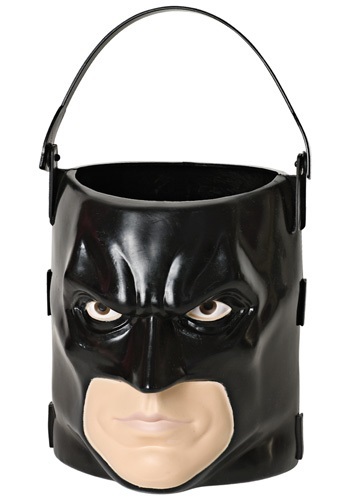 This Kid's Batman Treat Pail will do the job. With the big bad bat's stern stare, the Penguin, the Riddler, not even the Joker would think about trying to get their sticky fingers on a single sugary sweet. Your youngster will be able to run all around town without the tiniest worry of having his prized possessions being lost or taken by any villainous characters lurking in the shadows. Grab this treat pail to complete your tot's heroic costume or even just to express his fandom for Gotham's favorite vigilante!